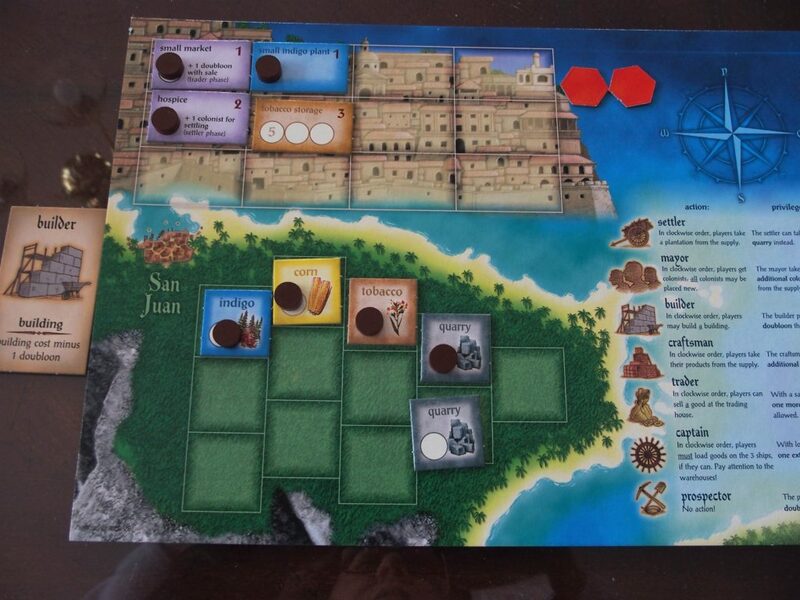 Puerto Rico is a classic Economic game created by Andreas Seyfarth. Although originally released in 2002, it continues to remain a top ten game in the BoardGameGeek rankings. Most players appreciate that there is very little luck in Puerto Rico. 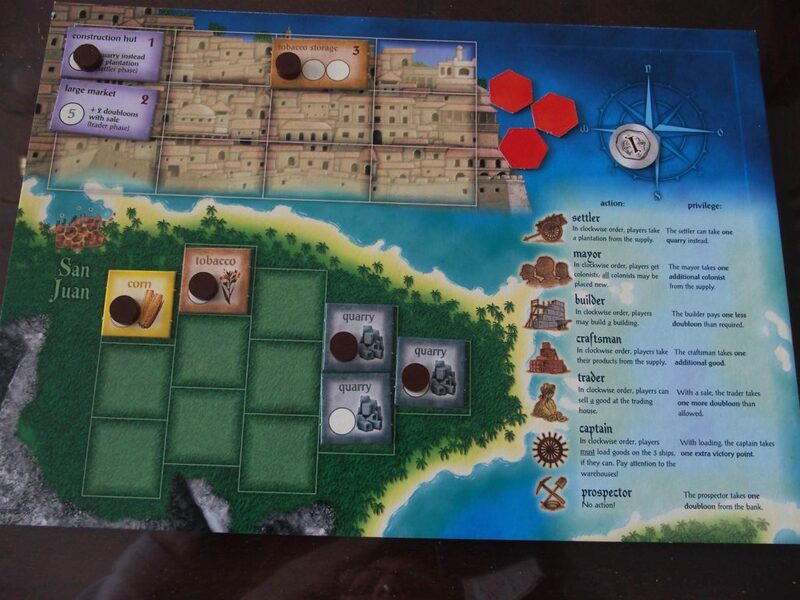 Each player starts the game with one plantation and 3 doubloons. Each turn a player selects one of the available roles and executes it. Then in turn order each other player also executes the role. The player who selected the role also gets a bonus. 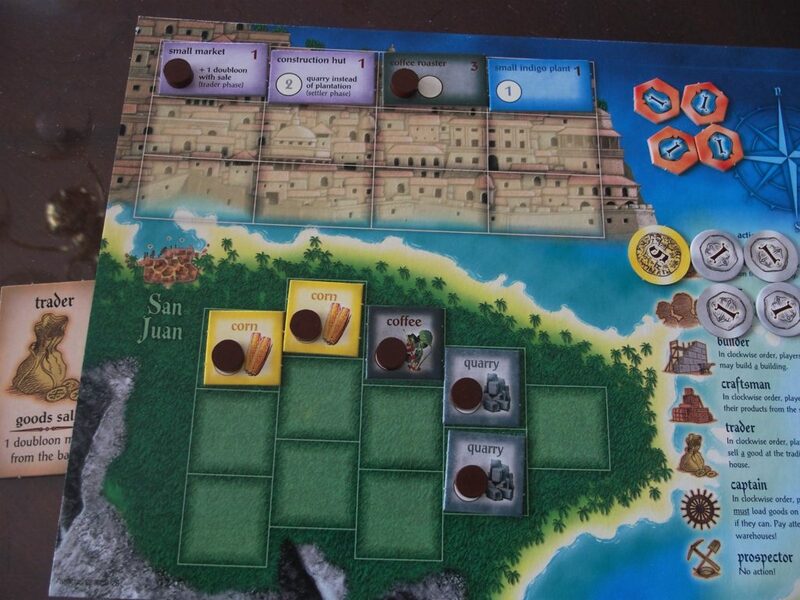 The goal of the game is to build an engine of plantations and buildings that allows you to accumulate victory points. At the end of the game, each player counts the number of victory points collected during the game, and also gains points for the buildings they have purchased. This game occurred at Congress of Gamers in late 2016. It is a little less than halfway through the game. On your turn, you were the Governor, selected the Trader and accumulated a handsome sum of doubloons. 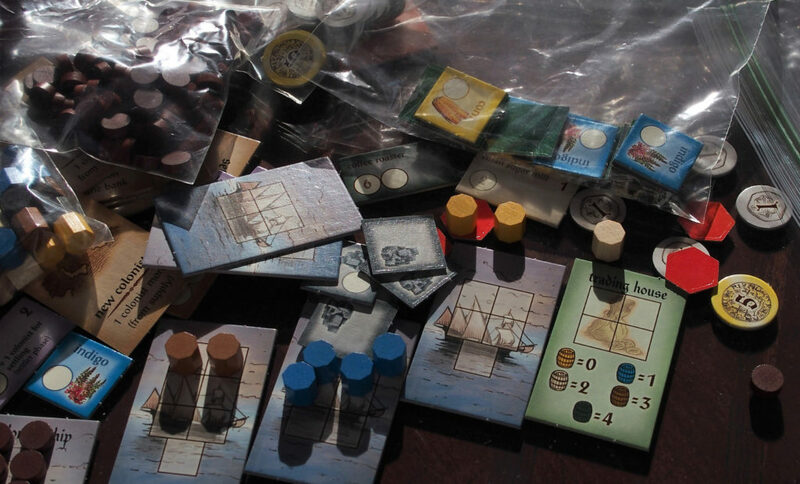 The next player selected the Builder action and purchased a tobacco storage. Now it’s your turn to build something. You are a big fan of the 4 point building Guild Hall because you feel it is easiest to obtain the maximum bonus points. With your quarries, you have enough to buy it now. However, it’s a bit early to purchase it. Another alternative would be to buy a good three point building that would help you earn more victory points. 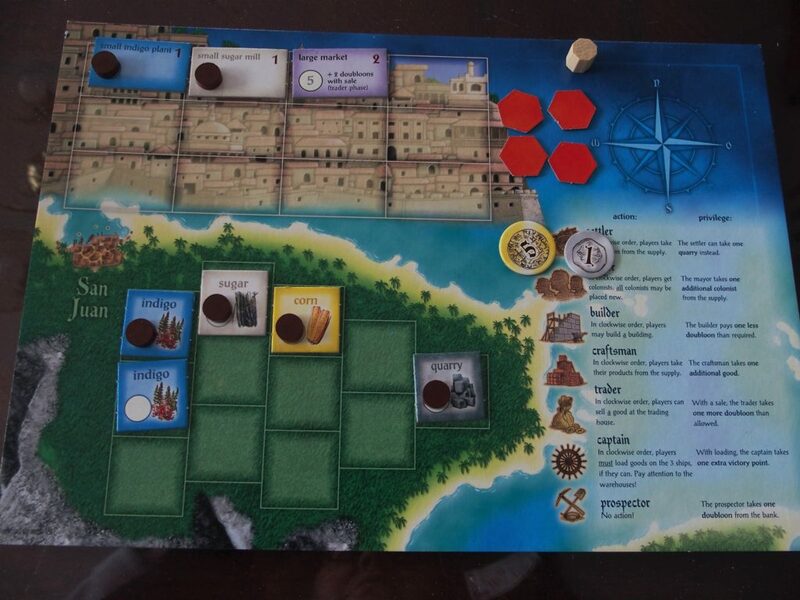 This will set you back on funds, and it might take a bit to get more doubloons to purchase a 4 point building. Lords of Waterdeep is a worker placement game for 2-5 players which was released in 2012. It has become a standard at open gaming events and tournaments. Players gain points or resources through completing quests, constructing buildings, playing intrigue cards or having other players utilize the buildings you have constructed. At the end of 8 rounds of play, the player who has accrued the most points wins the game. 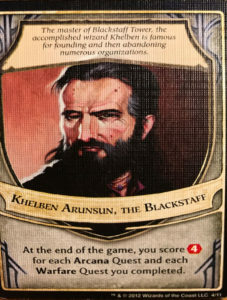 Your Lord is: Khelben Arlinsun who rewards Arcana and Warfare. With your first agent, you have played on the middle slot of CliffWatch Inn, and collected your Intrigue card. You are deciding which quest to take. Since your lord card rewards Arcana quests, you are looking at the two available Arcana quests and trying to decide which to choose. 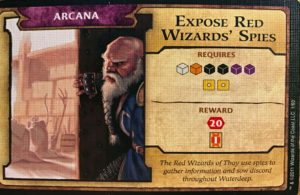 Expose Red Wizard’s Spies requires one white cube, one orange cube, four black cubes, and two money. It pays out 20 VPs and an intrigue card. 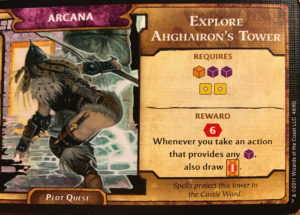 Explore Arghairon’s Tower requires one purple cube, two black cubes, and two money. It is a plot quest which gives an immediate reward of 6 VPs, but also lets you draw an intrigue card whenever you play a purple cube.